The first meal from the garden!! 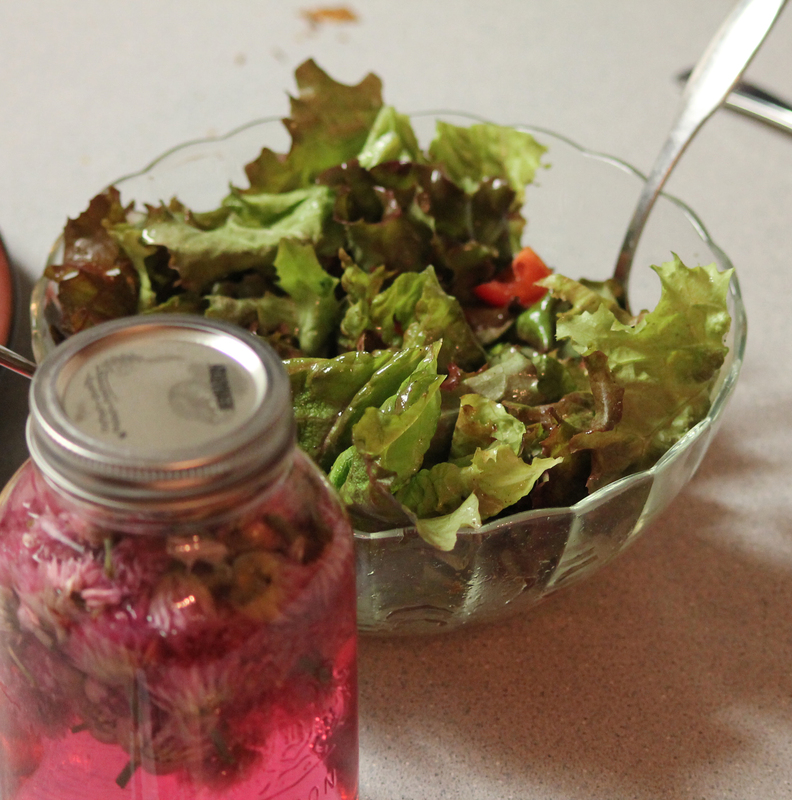 Red lettuce salad with chive vinegar dressing. YUM! Everyone should be quiet beside a little stream and listen. I love Karen Maezen Miller. I love everything she writes, I love everything she says and everything she doesn’t say. Her new book Paradise In Plain Sight is beautiful, but it’s not about gardening. Thank goodness. I do love her Lessons From a Zen Garden. Her book inspired me to think about what lessons I have learned from my garden. Always be careful about where you fish and what you fish for and whom you fish with. Be even more careful about what you take home and what you throw back. The point of all fishing is to become ready to fly fish. The point of fly fishing is to become reverent in the presence of art and nature. There is no way you would call my current garden a “zen garden” or a Japanese garden. I did have one once. It was at our last house on the wet coast. A modern-day version of what western gardeners thought an Asian Garden should look like. It was peaceful, quiet and beautiful. Already there when we bought the house, the garden was rumoured to have cost $30,000. It was based loosely on the Dr. Sun Yat-Sen Garden and designed on the harmony of four main elements: rock, water, plants, and architecture. When we moved here to Paradise Lane just off Paradise Road on the treeline above the grasslands I brought all my previous garden knowledge and prejudices with me. I wanted to keep gardening the same way. Ha! Well… I did have the same elements; rock and lots of them, plants I had never seen before…….. what was a plant or a weed. 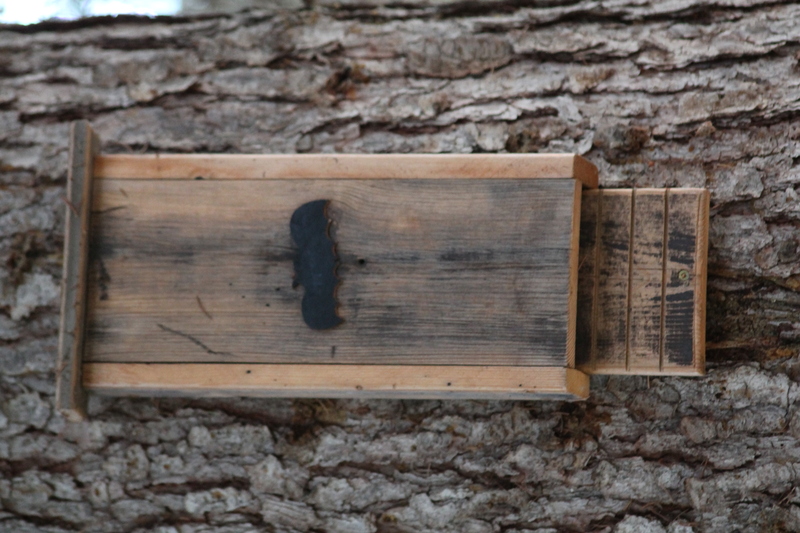 I had water, underground in a well and a raging creek as my property line. Some days it was there and some days not at all. Dependent on what the master gardener Mother Nature decreed, we also had fire and wind. Life and gardening lessons were in abundant supply. Peace and plenty were interchangeable with chaos, mayhem and nothingness, and nothing was controlled by me. But, this is after all, paradise, right here. After 13 years here I know that any desire I have to conquer or have dominion over this garden is for not. 1. Dandelions are not a weed. There are no weeds, just aversions. Dandelions here are the first food for bees and if you are walking through a field of dandelions and it is not buzzing, your crops are in trouble. I have already blogged about One Man’s Weeds Are another Man’s Toilet Paper. Ever wonder how so many dandelions end up in your garden? As a teenager my mom had a phrase about squeezing zits on your face. When you kill one a hundred more come to its funeral. Weeds and resentments react the same way. 1a. These are not dandelions. They are yellow and you never see them in anyone’s garden but sometimes in the spring they cover the hillside for a very short time and photographers vie for the best shot of mass balsam in bloom. The biggest resentment in my garden is Burdock. Weeds & resentments are very similar. 2. Something very, very small can cripple or enhance a garden, a life, an economy. Pine trees grew everywhere in these parts and farther north. They were part of the basis of our forestry resource sector. A tiny beetle the size of a grain of rice killed millions of acres of pine, sometimes destroying whole communities. Little things can also be a sense of joy and renewal. The tiny violets hiding under the no weeds. The baby tree, a gift from its mother, protected by her dying roots and fed from her decaying body, or the first damselfly of spring. 3. Water is important for living and nurturing. Water from a shallow well can be a great teacher if you mindlessly leave a tap running and drain the well. How you water your garden is also how you should water your life. A gentle shower nurtures growing plants better than the harsh jet setting on your hose nozzle. Relationships are the same. 4. Be careful whom you invite to your garden, just like being careful whom you invite to fish with you. If you live with five cats be prepared for the Nepeta to be eaten to the ground. If you live with a non gardener don’t expect them to know the difference between dandelions and balsam. Be careful what you ask of them; like weed whacking, or watering. Not everyone has the soul of a gardener, but they do have a soul. Forgiveness helps. 5. Rocks, integral to a Zen Garden, and dirt are important in my garden as well. They teach about sensing, seeing and listening. You can build walls with rocks, use them as a door stop or make them part of your meditation. I am an addicted rock collector. I am always picking them up on walks. Rocks have solid stories to tell. They are the foundation of the earth. I always add the small ones that talk to me to my fountain below. The large lava formed rock is a “grandfather” used in aboriginal sweats….the ancestors are always invited and blessed at a sweat lodge. 6. I have a notion that change happens slowly, It only took a short time here with a windstorm and a fire to disabuse that belief. In ten years over 100 trees have died or fallen. We spent two weeks evacuated by a raging fire. Impermanence gets bandied around so much today. Yes, eventually everything changes and disappears. Even saints get old and broken. Gardens and living disabuse a lot! It also creates sunflowers. Leaving areas in their natural state invites deer and bears to eat and sleep. Fallen logs and overgrowth along the creek promotes bug life and shade for the returning salmon. Gardens need to be shared. This type of gardening transcends the needs of the gardener. It’s not about gardening anymore. Sometimes the nature of my gardening seems so chaotic and out of control; my life too. Unclear or in ruin, taking refuge in wildness can give an order to all things. 8. Children belong GROW in the garden. They are washable and you can just towel dry. As a grandmother, teaching my grandchildren their first nature lessons is a privilege. I feel so sad for little ones that think nature is something you see on tv, or who are afraid of bugs, worms, snakes and dirt. In a garden they learn they are not alone, it connects them to a world that is small and infinite at the same time. They learn their place. I love this word. Get down on your knees in the garden with reverence and worship. It teaches servitude and humility. Thank you Karen Maezen Miller and Howell Raines! 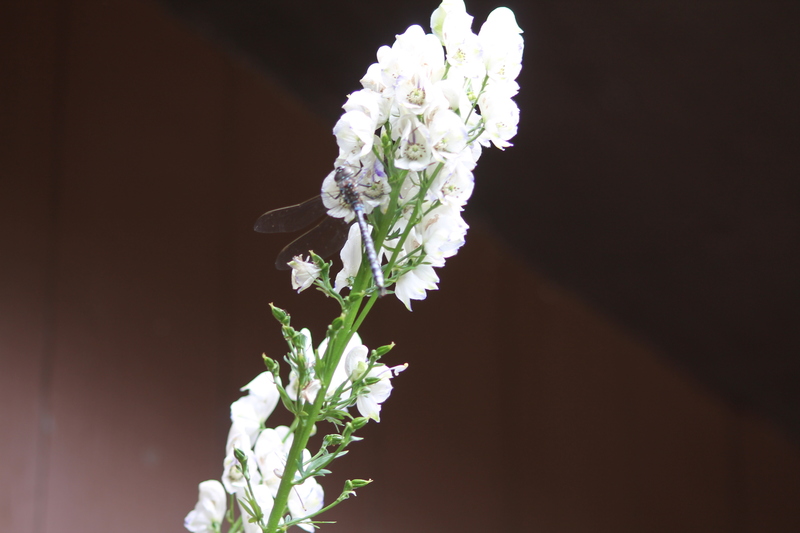 The garden is humming with all sorts of insects and creatures. I have planted to attract butterflies and bees and its working. All day you can see and hear them feeding and gathering. 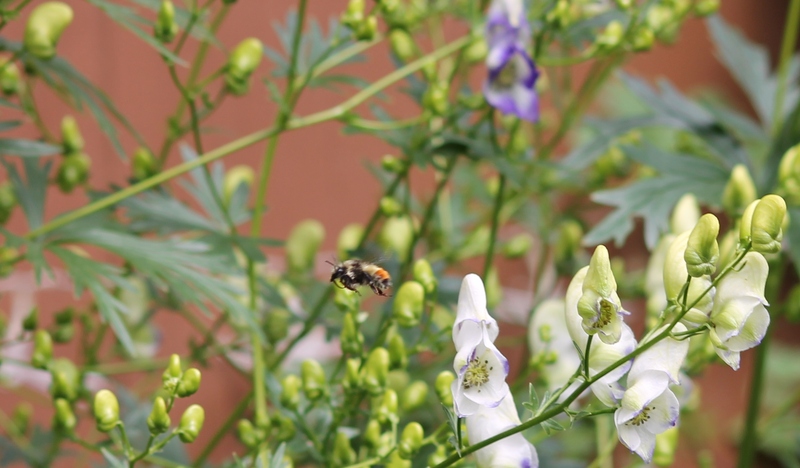 They love the Delphinium, and I love to watch them go in and back out until they are loaded with pollen. 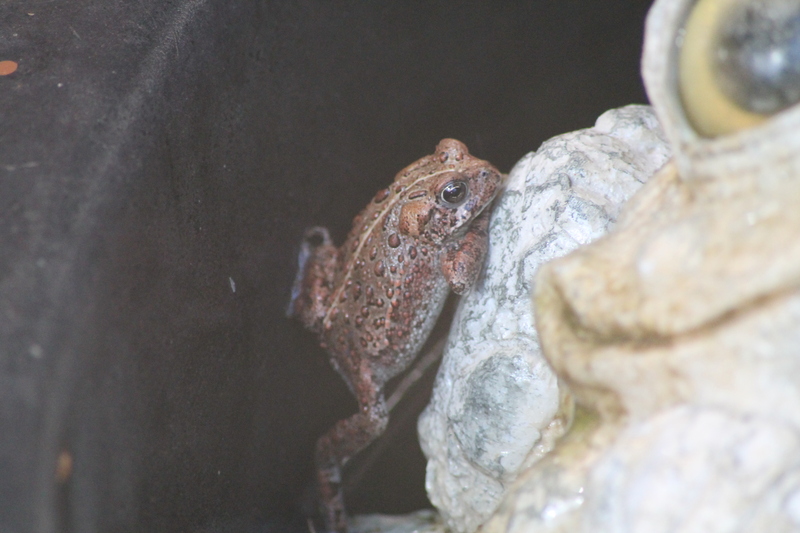 The pond attracts creatures as well especially since it has been so hot. We had 30 days of sunshine in July, and the temperature has reached 30 degrees C. most days. It cools down considerably in the evening and our friends the bats come out in droves to feed on mosquitoes and other small bugs. We built houses for them last year, and we have quite a clan now. Imagine my surprise to wake up this morning to find one of our friends came for a sleepover. 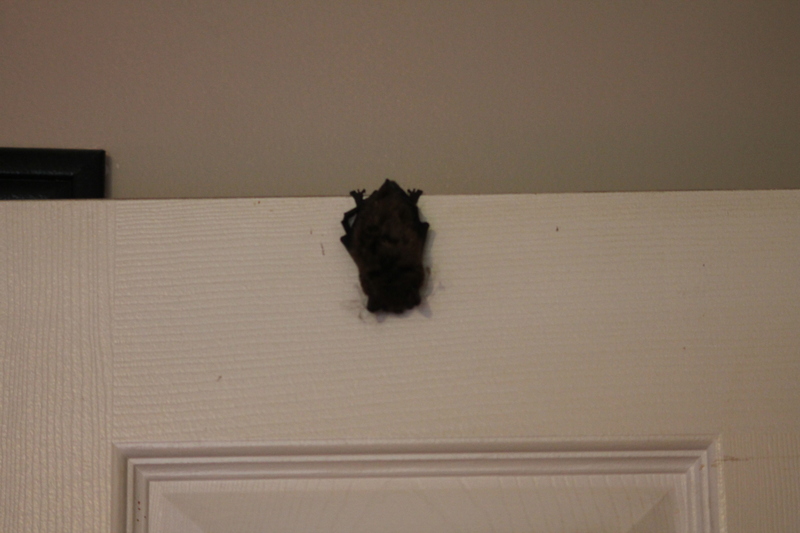 He was hanging from our bedroom door. I didn’t want to wake him after such a hard night’s work. Conversation on a Friday at work. Q. What are you doing this weekend? A. We are going hiking in the hills to pick Burdock, it’s a healing medicine. Q. What are you doing? A. Working in my garden, trying to kill Burdock. 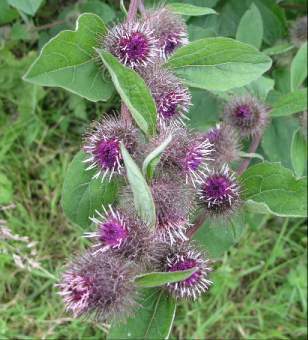 Burdock is a medicinal herb, native to Europe and Northern Asia, but also grows in the United States. It is a relative of the Feverfew, Dandelion, and many other biennial thistles in the daisy family. It’s main healing properties are found in the root. It can purify the skin, remove blood toxins, eliminate fungi, prevent infections and is antibacterial. It can be used in detoxing. I am trying to get rid of for its most interesting benefit. It was the inspiration for Velcro. After taking his dog for a walk one day in the early 1940s, George de Mestral, a Swiss inventor, became curious about the seeds of the burdock plant that had attached themselves to his clothes and to the dog’s fur. The result of his studies was Velcro. I am a natural gardener. Killing it means pouring salt on it. It took about 10 lbs. of salt. I have a lot of Burdock.